Baguio City referred to as the Philippines’ summer capital due to its cool climate, is also the center of business, commerce and education in Northern Luzon. Hence, many Filipinos, and foreigners love visiting or living there, not only because of the comfortable temperature, but also the myriad of activities they can do there for fun and relaxation, or occupation. 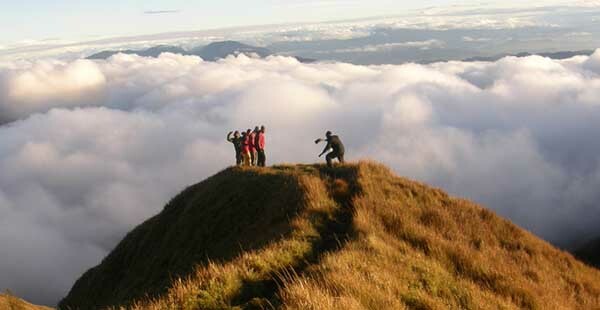 #1 - Mount Pulag: It is the highest peak in Luzon, and 3rd among Mount Apo (1st) and Mount Dulang-dulang (2nd). Standing tall at 2,922 meters above sea level, Mount Pulag is where the borders of Benguet, Ifugao and Nueva Viscaya meet. You will lose sight of the land below this majestic mountain, when you reach its highest point, because of the sea of clouds visible all around you. Not to mention, you can witness the view of the Milky Way Galaxy from there at dawn and just get awestruck by this breathtaking, out of this world, sight! #2 - BenCab Museum: Benedicto Reyes Cabrera, also known as BenCab, is the Philippines’ National Artist for Visual Arts, as proclaimed in 2006, by then Philippine President, Gloria Macapagal Arroyo. His life’s timeline, from his childhood, up until he got famous world-wide for his paintings, are filled with lots of wonderful achievements such as “ Larawan” exhibited at The Luz Gallery; Prints and Drawings at Galeria Norai in Mallorca, Spain; and his most enduring image, “Sabel”, to name a few. Visit his museum to enjoy both art and nature, as you gaze at his award-winning masterpieces, and sip coffee with your buddy or family at their awesome café…lovely! #3 - Good Shepherd Convent: True to its name, Good Shepherd Convent is a religious institution that gives charity to the poor by selling delicious food products such as strawberry, ube and coconut jams; as well as cookies, peanut brittle and cashew. It’s an excellent stop if you are coming from Mines View Park; you’re not only helping send the Cordillera Youth to school, you can also surprise your friends and family with these yummy treats – so cool! #4 - Philippine Military Academy: A training school for the future officers of the Armed Forces of the Philippines, the Philippine Military Academy is where you can take pictures with the polite and smart cadets there, in addition to having the chance to watch them march in synchrony; learn about history from their museum; also, snap photos with the lush landscape, military relics and even get to grab a bite at their nice cafeteria. Be sure not to come in wearing slippers though, to be allowed to enter, just so you know. #5 - Burnham Park: It’s at the heart of Baguio City; you would wish life is always a walk in Burnham Park! Perfect for a lazy afternoon when you’d just like to breathe the pine-scented cool breeze, while enjoying a chat with your friends or family – buying all sorts of snacks on sale all around; and boarding swan boats on the lake beside, where tourists do abound.